THIS STORY ISN’T ABOUT A RACE, although it happens during The Boat Race between Oxford and Cambridge. It isn’t about winning or losing, although they both happen, to the same team, on the same course. This story isn’t even about coxing, although, as I’m sure you already know, nearly every story ends up being about coxing, in one form or another. It’s universal; it’s decision-making, directing, responding to things beyond your control. You know what I’m talking about. But, back to the story. Let’s set the stage for a minute. Rosemary Ostfeld, the coxswain for the Cambridge University Women’s Boat Club, has her hand in the air. A moment goes by. Another moment, and now Oxford University’s cox, Morgan Baynham-Williams, raises her hand. Both coxes work their position at the start, getting their point. For me, an American who hasn’t yet coxed the Thames, The Boat Race holds mystery. “The Surrey station,” for instance, is the name for the course along the southern side of the Thames that follows the banks near Surrey. Not “Lane One” or the “South Course.” Each crew has a “station,” and must respect their course accordingly. Until they’re ahead, of course. As the race begins, Ostfeld gets her crew away cleanly, while Oxford seems to sit for a moment on the stake boat. On Middlesex station, Cambridge has the earliest advantage, as the river turns slightly toward their side as it approaches Hammersmith Bridge. The wind continues to gust, swirling the flags on the motor boats behind the two shells. There’s something about The Boat Race that transcends all other races. Maybe it’s the history (the men’s race started in 1829 and has been run 162 times; the women’s race began in 1927 and has been run 71 times), or maybe it’s the demands of rowing on an unpredictable portion of the Thames, fighting the ocean tide as well as the river’s current. Or maybe–as is true with the American version of this race, the Head of the Charles–this is a race that is not only a test of sheer power and rowing ability, but a test–in the purest form–of the ability of the coxswain. It’s like Coxing University, with every class held on the 4.2 mile course between Putney and Mortlake. As the two crews approach their Settle, and the coxes call the stroke rate down from the forty-somethings, the shells begin to weave toward each other, as if they’re magnetized. Both coxswains know that the fastest water is in the Tideway, that channel of deep, fast-moving water in the middle of the river. Ostfeld holds her line in the Tideway as the river begins its turn toward the Middlesex station; Baynham-Williams and the Oxford boat edge in to feel the run of the Tideway at its strongest. Ostfeld doesn’t yield; she is on her station. 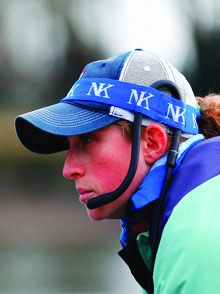 Ostfeld started coxing in high school, after an injury in gymnastics opened up her afternoons. “I’m not even that tiny,” she says. “I’m 5’ 2” which is one of the reasons I coxed boys.” Ostfeld found she liked being in the coxswain’s seat. “When I started coxing, I thought it would be a temporary thing,” she says. “I didn’t want to let go of sports, but realized I had to let go of gymnastics. Coxing was so different. It meant being a part of a team. Gymnastics was an individual sport.” A pause as she reflects. After earning her bachelors degree from Wesleyan University, Ostfeld chose to pursue a PhD at Cambridge. One of the advantages of studying abroad was that the NCAA eligibility rules don’t apply. Ostfeld could keep coxing. “When I arrived, it was crazy,” Ostfeld describes the try-out camp she stepped into during her first few weeks in England. “There were ten coxswains competing for the boats. Sam Ojserkis [the coxswain in the U.S. Men’s Eight that just qualified for the Olympics] was there. He had just won in the U-23 boat. I thought to myself, ‘I don’t know how long I’m going to last here.’” Ostfeld coxed the men’s reserve boat in 2014 and has been in the women’s boat for the past two seasons. As Cambridge approaches the first bridge, Hammersmith Bridge, Oxford puts on a power move and surges ahead. Cambridge responds, but with every stroke Oxford gains a few inches. Ostfeld holds her shell ever closer to Oxford, fighting for the Tideway’s advantage of speed. The umpire calls for the crews to separate, but neither coxswain yields. At one point in the race, Cambridge’s two-seat oars are in sync with Oxford’s seven-seat oars, and just a foot away. As the race unfolds, Oxford continues to pull away, the open water between the crews growing. The wind that was swirling at the start of the race is now running rampant. The river begins to throw waves up for the crews to navigate. Oxford crosses toward the slacks (the calmer water along each bank) on the Middlesex station at one point, then returns to the Tideway, then crosses back again, as the waves grow bigger. Ostfeld stays her course, remaining in the thick of the Tideway, and Cambridge begins to battle the waves the Thames has in store for them. No one could know what was to happen next. If this were a screenplay, and you were a producer, you’d call the studio and get the cameras rolling, for what happens next is the stuff good cinema is made of. As a coxswain, you’re in charge of the responses your crew makes in a race. Your decisions have a direct outcome on the situations that face you in the heat of battle. Ostfeld could see the situation. Her boat had fallen several lengths behind. Oxford was now in the slacks–ahead, yes, but rowing in the slowest water. You know that every action you take will have an impact, every decision you make will have an outcome. Every member of the crew, really, is in the same position, but only the coxswain can see the entire scene unfolding; only the coxswain has the rudder. Where it gets dicey, in this story, is in the outcome. If Ostfeld had followed Oxford into the slacks, it’s likely her boat would remain where they were–more or less–in relation to Oxford. In the choppy water of the 2016 Boat Race, it’s likely they’d not be able to make up the open water. If, however, she stayed in the Tideway, she would have a chance to give her crew an advantage. They might make up distance and they might be able to match Oxford as they entered the final leg of the race. Might. As a coxswain, how much time do you have to think about this? How quickly do you have to make this decision? For Ostfeld, the decision had been made many months before. She knew the strategy of this course. She knew the speed they needed was in the Tideway. She knew she had to take the risk. “It’s kind of funny talking about it now,” she says, a few weeks after the race, as we do the interview for this story. “It was kind of unexpected.” What she’s referring to is what happens as Ostfeld and her crew approach Barnes Bridge, chasing their opponent by using the stream that is the Tideway’s advantage, rowing in the densest waves of the day. As the conditions grew worse, three squalls crashed over the bow and gunwales and filled the Cambridge shell with water. If the boat hadn’t been built with the technological advancements of the last few decades, it may have sunk. And, even though there were pumps on board to clear water from the cockpits, they, too, were submerged. Cambridge was rowing a boat that was disappearing, water crashing in over the gunwales as the rowers continued rowing. Not once, in the craziness of the waves and the chasing and the submerging, did a single rower hesitate in their stroke. Not once did they respond to the persistent calls from the umpire to stop rowing so they could be picked up by the motor boats that were following the race. Not once did Cambridge think about doing anything but finishing their Boat Race, water and pumps and waves be damned. I ask Ostfeld if she heard the calls from Klegg, the umpire who was trailing just behind them in a motor boat. “Oh yes, oh my gosh, yes,” she says. “We heard them all.” The next call the umpire made was to Ostfeld, “Cambridge, if you want to keep going, keep going.” And with that, Ostfeld’s hand was in the air again, just as it had been at the start of the race. Her hand became the signal to Klegg, and to everyone who was watching, they weren’t stopping. Once the Cambridge crew made it through the Barnes Bridge, Ostfeld headed for the slack water along the Middlesex bank. Eventually, the pumps in the boat cleared enough water for their gunwales to rise to a height that was close to normal. Cambridge completed the race. “Of course, you want to win. It’s heart-breaking not to win. We did the best we could in that race. Oxford is a great crew. It is definitely a race I will not forget. This story was never just about a race, or about coxing. This story is about a coxswain’s hand held in the air that says, quite simply, we’re not stopping. Rosemary Ostfeld has coxed for East Lyme High School, Wesleyan University, the Blood Street Sculls and Cambridge University. She is a PhD candidate at Cambridge University in the Department of Land Economy, Environmental Economy & Policy Research. Her research has taken her to a different river, in the depths of the Malaysian jungle, the Kinabatangan River. She studies the palm oil production that threatens the surrounding ecosystems and the impact certified production practices have on the industry.